Wisconsin coach Hector Valdivia has been a part of the Hodag program long enough to see its ebbs and flows. Ten years ago, the 2008 Wisconsin Hodags won their third National Championship, fielding a deep team of players whose names went on to grace the rosters of the top club programs in the US. Brandon Malecek, Matt Rebholz, Jim Foster, and Tom Annen helmed the Hodags to their third and last title to date in a dominant, well documented season for the program. 2008 was also the year that Hector Valdivia returned to Madison, Wisconsin, after spending time in Colorado post-graduation. Valdivia had been a core player for Wisconsin during the 2003 team’s championship run, the cap to his five year career there. In ’08, he became the head coach and led the Hodags to two more finals appearances in 2011 and 2012 but came up short of a title. Yet, while Wisconsin has yet to recapture the magic of those championship teams, they have been a steady, consistent presence in the upper tiers of the men’s division. There’s nobody who knows the story of the Hodags like Valdivia, the passionate and cerebral steward of the modern program. Valdivia has been right there with the Hodags for over 10 years. In 2016 and 2017, Wisconsin was within a game of the semifinals and played at a level that was arguably worthy of a semifinal appearance. But they were outplayed in the rain in Raleigh by Pittsburgh and suffered a massive collapse against North Carolina, both times in quarterfinals. While the loss was devastating at the time, it is not necessarily something that has defined the current crop of Hodags. While some college programs dwell on the previous season to find their motivation, Valdivia sees it differently for Wisconsin. “We’ve been busy laying the foundation for a new core of talent to write their own story into program lore,” said Valdivia. 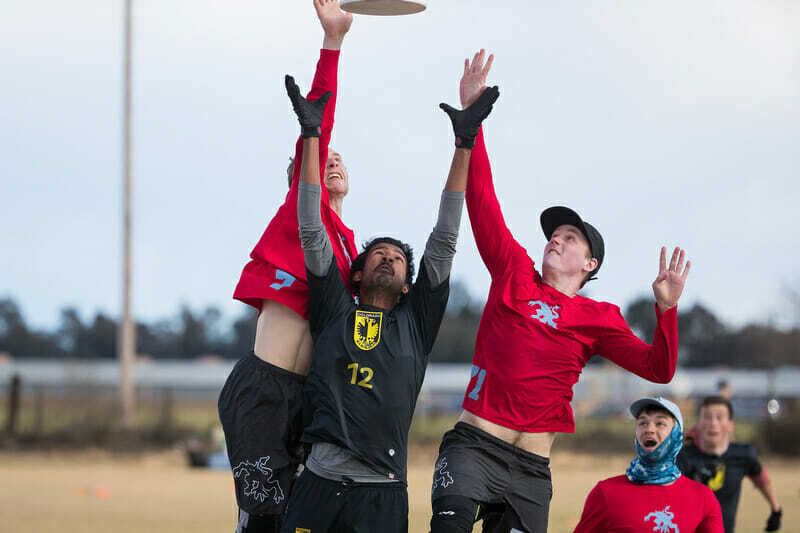 The program lore Valdivia referred to is very much a piece of the men’s division in college ultimate. It’s a way of playing the game and building a program that has roots that have secured the Hodags more consecutive Nationals appearances (19) than any other program competing in Milwaukee this year. Wisconsin’s blueprint is built around the idea of creating an elite program, not elite players. The approach calls back to the team’s early years, when the Hodags lacked the polished throwers and polished offense of other college teams. Instead, Wisconsin turned to its defense. “We focused on our athleticism and strength in numbers to build a team fueled by defensive intensity,” said Valdivia. Even in lean years, like their very quiet 2015 season, Wisconsin stayed steady by earning enough breaks in games to make life difficult for teams and qualify for Nationals competing against teams that have no want for skilled youth players. To compete in the North Central means to compete against a college program with the strongest youth pipeline in the country, Carleton CUT, Wisconsin’s long-time foe. The rivalry between the schools dates back almost thirty years, and it’s easy to see why: they have two vastly different styles and cultures. Carleton builds stars. Wisconsin builds role players. Carleton draws five-star recruits from all over the country to a small private liberal arts college with just 2,000 students. It’s impossible to separate Carleton from their draw of talent from Seattle, North Carolina, Boston, and beyond. Wisconsin, on the other hand, doesn’t rely on the luxury of elite high school players coming in from outside of the midwest to their school of over 40,000. Carleton’s the Italian import. Wisconsin is American muscle. 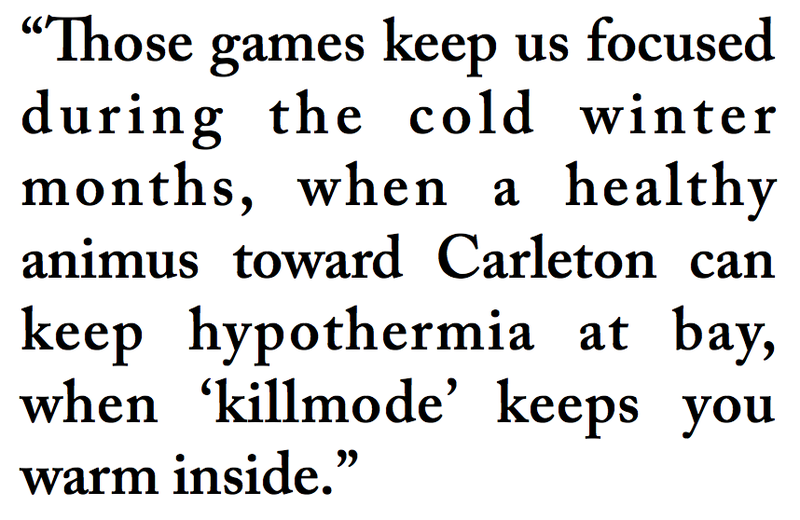 “Those games keep us focused during the cold winter months, when a healthy animus toward Carleton can keep hypothermia at bay, when ‘killmode’ keeps you warm inside,” said Valdivia. Usually fierce rivals, Wisconsin players paid homage to Carleton on the fields at the Stanford Invite. 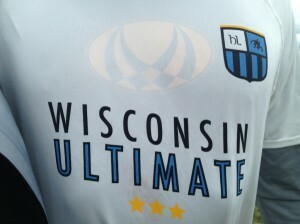 Behind the vitriol and animus that will always exist between Wisconsin and Carleton, there is also a genuine respect for one another, in part fostered by the fact that to play in the North Central Region requires a different kind of commitment to practicing and training in a winter chill that lasts an eternity. North Central teams share that identity and wear it with pride. The hostility of the environment those teams train in and travel through became very apparent in 2014. Out of respect for the three Carleton players who lost their lives in a car accident en route to the Stanford Invite, Wisconsin wore CUT jerseys beneath their own that weekend. A lighter moment of North Central pride was on display during the rainy semifinal between Minnesota and Pittsburgh in 2016, as Wisconsin and Carleton players congregated, cheering on NC compatriate Grey Duck (and heckling Pitt) late into the night. But with Carleton now sitting atop the division with a second straight title in its sights, the desire to beat CUT remains strong in the hearts of the Hodags. “Our desire to beat each other hasn’t cooled at all,” said Valdivia. With Carleton now the favorite to win the matchup, Wisconsin faces an uphill climb every time they meet their nemesis. It calls back to an earlier time: those late 2000 games against Florida, with the biggest difference probably being the lack of interregional respect. But while rival Florida coach Cyle Van Auken may still embrace the rivalry (having been a part of it himself), Valdivia doesn’t quite feel the same. “Our annual game against Florida at Warm-Up is a highlight of the early season and always a battle, but ‘classic rivalry’ is a bit much right now, with so many years passed since we last saw them in May,” he said. “Come to think of it, Florida has struggled to reach Nationals since Cyle and I made peace, so I offer that in accepting my friendship, a little of the light that kept the Florida machine going has maybe gone from Cyle’s eye, and in reading this he will doubly commit to beating us next February. I can only hope,” he added. That Florida is the antithesis of Wisconsin is only too fitting. Valdivia’s approach, and that of the other Wisconsin coaches, Andrew Brown and Becky LeDonne, has turned Wisconsin into one of the great legacy programs in the country. Where other teams have faltered, Wisconsin has shone in their own rough and ready manner. With Colorado now out of the picture at Nationals, having fallen to Texas in the South Central game-to-go only four seasons after winning a title, the crown of most consecutive Nationals appearances now rests upon the heads of the Hodags. One of the big secrets to consistency, as Valdivia mentioned in his post-Regionals tweets, was bringing on assistant coaches. Brown and LeDonne have been very valuable contributors. LeDonne, notably, is one of the only female coaches in the Men’s division. “Each season more teams are better prepared, and it takes more energy and resources to stay at the top. The days of qualifying for Nationals year in and year out on name alone are dead,” said Valdivia. While Hodag alum and former teammate Andrew Brown complements Valdivia’s temperament, that addition of LeDonne last year added the fire and intensity that the Hodags also needed. “We wanted her diverse perspective on playing styles to help keep the program fresh,” said Valdivia. Ledonne pulls no punches when making adjustments and firing up the squad. Her vocal presence and the demands she makes of the Hodags matches the team’s defensive-oriented brand perfectly. “I harp on players about our marks and about catching our Ds. The two things I probably yell most about are “ARMS” because many players in general seem to want to rest when they’re on the mark, and “CATCH!! !” when a disc goes in the air and we are on defense,” she said. With LeDonne rallying the team with her battle cries, Valdivia’s visceral speeches in the huddle, and Brown’s straight-line talk, the Hodags have remained far more than relevant; they have stayed ahead of any potential threats to their run of Nationals appearances. The fiery spirits of former Hodags are manifested within the very heart of every new crop of players, in no small part because of the steady hands that have guided them the past 19 seasons. The humility and awareness of the program’s past, and current, needs have bled into Valdivia’s thoughts on Wisconsin competing on their home turf at Nationals. For him, while it will be nice for Wisconsin to be back at home in front of fans, that doesn’t necessarily convey an advantage. A rematch from last year’s college championship awaits for the Hodags in Milwaukee. They will once again face an Oregon squad that has semifinal ambitions, as well as a Georgia team that they faced the last time Nationals was hosted in Milwaukee. With Wisconsin sitting in the middle of the pack as the 3rd seed in pool C, the opportunity to block, huck, and snarl their way to glory awaits for the Hodags yet again. Comments on "I Bleed Baby Blue: Hector Valdivia’s Hodag History"